Hey it just started to rain. Oh no, its gone. Well there was a wee bit of something. It was spitting. Though the sky spitting on me is not a sweet analogy. We have not had rain since the middle of June so I guess even those few spits are welcome. Shortly we are going to have to resort to some kind of rain dance. And that is not a picture I want anyone carrying around in their heads for the day. And yes it is still hot, but there is a wee breeze, so all is not lost. This is a chook photo from my archives. I will tell you about it soon. Now we were going to discuss chickens on the farm. They are pretty important. Because they are the clean up guys. They are practically camped under the apple trees this week. When I weed the flower and vegetable gardens all the weeds that are deemed edible, which is most of them, are thrown into the chook run. They eat left overs from the house kitchen. They turn over the hay in the barn every day looking for tasty morsels. they have dust baths in the most inconvenient places but what can you do. They work for free. They are my waste disposal units. I have two flocks. One spends their morning in the chook house being good girls and laying their eggs before coming out in the afternoon to make trouble. The other flock is smaller and sleeps in the rafters of the barn with the guineas. 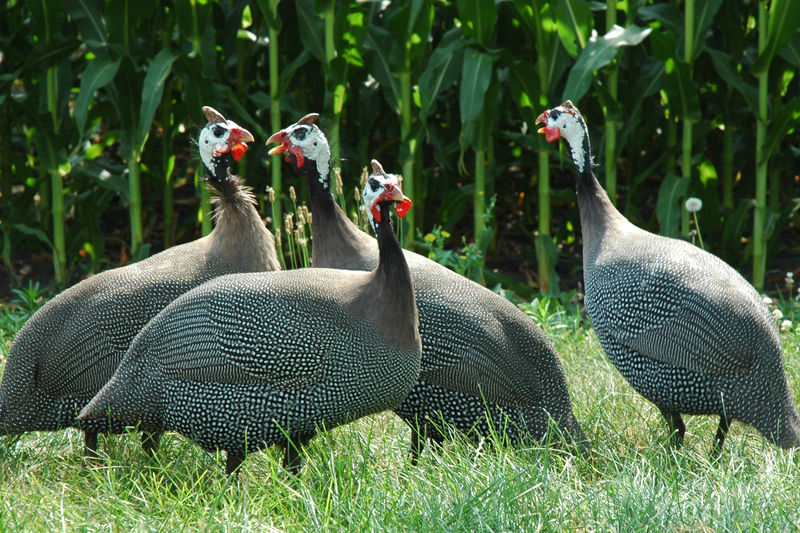 See below: These are the guineas, these are not chickens. And yes these birds are really as ugly as they appear. Their job is to wander about and eat bugs. But they just wander about and make a sound similar to a bug that needs his bicycle chain oiled. They squeak about the property. And they don’t even eat Japanese Beetles! People say they are good watchdogs but they don’t do that either, more often than not they saunter slowly in front of the approaching car thinking squeaky thoughts. TonTon used to herd them but he has given up on that because they take no notice of him anymore. Anyway back to the chickens. Their eggs are fed to every animal on the property. The cats dogs, cows and sheep all line up for their daily eggs and milk. I have tried every recipe known to man or woman that uses lots of eggs. I cannot wait to get a pig and then I can feed the little oink eggs and milk as well and won’t he be YUM! 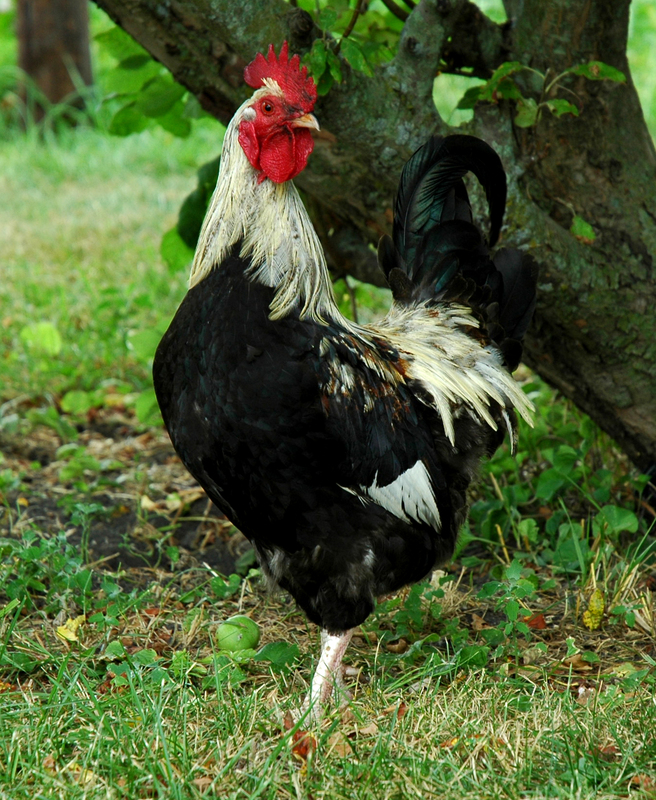 Here is Rooster 3. Not pretty either really. And so to all those egg shells. These get crushed then thrown into the vegetable gardens. Good for tomatoes evidently and a great deterrent for all manner of little crawlies in the soil. Calcium for the soil. I also put crushed shell into the worm farm. I must tell you about the worm farm sometime soon. The chickens are the manure spreaders in the fields. Now anyone with a weak stomach may not want to read this paragraph. But the moment the chook house flock is let out in the afternoon, they race each other to the cow pats. They jump into them and scratch about looking for seeds. Flicking clumps of cow poo in all directions. It is quite revolting to watch but perfect for fertilising the fields. Sometimes I feed Daisy oats (which pass right through her undigested), to encourage the chickens in their job as farm manure spreaders. Isn’t that just awful! I feel so bad. OK moving on. Here is a nice picture of lambs to take the nasty image of flying poo out of your head. So there you are. Chickens, chooks, hens. They are one of the pivots of my little farm system. Our attempt to live sustainably without waste. Now I have started a flag counter on this page so we can see where our readers are visiting from as a bit of interest. So far though I have had 379 visits. Thank you so much for dropping by. I am loving it. And your comments are great. Now, I am going to go and make quiche. I will use todays eggs, and zuchinni and onion from the garden. This is a popular Buyswheeler recipe so I will write it up for you tomorrow. Though I need to warn you that my recipes are of the ‘a bit of this and a bit of that’ variety. ← Ten Tips on surviving a Heatwave without Airconditioning. Cecelia, it’s so great to read about the chickens and get a feeling for what is to come for us and our chicks. Ours are about a month old, so we still have some time before we are getting eggs. We have just started letting them out in the chicken pen we built off the hen house. They are happy to go outside as soon as we open the door in the morning, but we have to pick them all up at night and put them back. Any idea as to when they will start going back into the hen house themselves in the evening? We have 3 goslings and 10 ducklings who also live in the hen house. We have to pick them up and put them in at night too. Granted, this is only the 3rd night they’ve been out, so maybe they just aren’t ready to go back in…but….just wondering when they’ll go back in by themselves. Any idea? You are doing exactly the right thing, usually the mother hen flies up to the roost and calls to her chicks to join her. So you are being Mother Hen. Now short of crouching on the roost yourself and cheeping to your chicks to join you – you will have to lift them up there. They have to get up high to be safe. If I have this problem I go out when it is almost dark or in the dark and lift them up. Usually in the dark they will stay up there for you and after a week or so they will get the idea. Sometimes a bit longer. I had to teach the guineas to roost in the barn as they were determined to sleep in the guttering of the garage and they are big birds now so you can imagine. After about a week or so they will always go back to roost in the same spot. My ducks had to be separated from the chickens in the end, they are so messy and slept in the barn with an open door, but in the summer the ducks just seem to sleep on the ground wherever they stop for the night. After a few years though I gave the ducks to a guy with a big pond and they are happiness filled out there. Hope this helps. Let me know how it goes! Thanks so much for the scoop on the chicks Cecilia! We are actually getting used to lifting them back into the hen house each evening. The chicks are quite calm when we do it. And some of them are already going back in by themselves, which is fabulous. Our worry is getting the ducklings and goslings back into the hen house at night. They run like crazy to get away from us, and we end up having to herd them into a corner to pick them up while they are still madly trying to get away from us. We are afraid they are going to hurt themselves in the process. 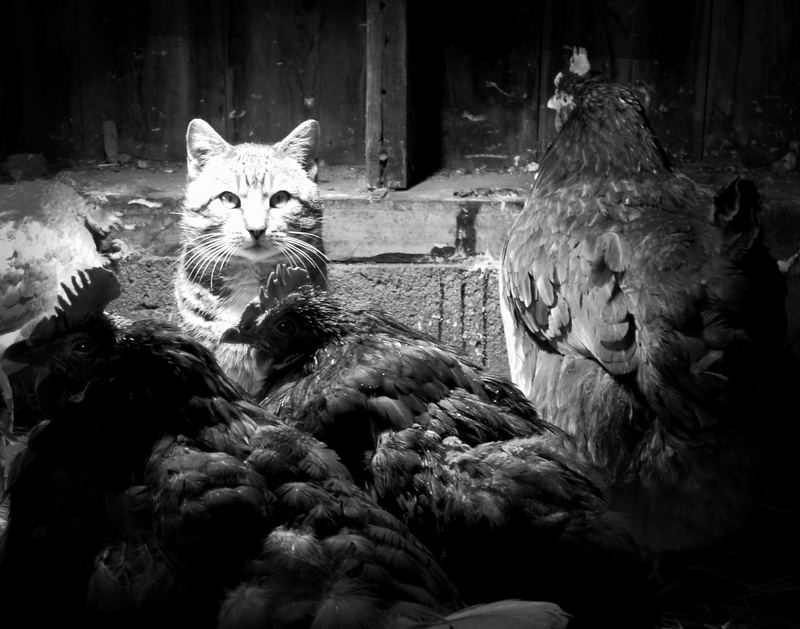 We’re hoping that they’ll get used to us soon, and better yet that they’ll gain confidence to walk back up the plank that leads into the hen house, thus avoiding the chase as night falls every evening. I see your worry with the goslings and ducklings. You are right that panicking and grabbing should be avoided. In fact those birds can very easily tear a muscle at this age plus stress is to be avoided with any animal, so I can see why you want to avoid chasing them.. Firstly: can they stay outside at night? if they are safe out there I would leave them. Going inside is not natural for them unlike chickens and guineas who like to roost. Secondly Ducks like to sleep by their water. You will have given them a big shallow but full water container (they like to get their heads right into it , snort it through their nostrils and fling it all about ) and mine always slept gathered around it.. Maybe put their water inside then go out after dark and lock up. Thirdly ducks will flock and geese will flock but ducks will not flock WITH geese. So if you were to herd them gently in – do it separately. I was walking the dogs thinking about your problem when I realised that maybe you should just take the passive herding route. My favorite. Fill up their water inside then Feed them inside in the evening, calling to them and when they are all in shut the door. And now that it is dark I am off out to lock up my own chickens! i always do their bedtime after dark otherwise I have to use the passive herding with FOOD! As an aside i always find that the old chickens go to their roosts early and the young ones always stay out until dark.. hilarious! Thanks for these great suggestions Cecelia! I’m thinking, as you have gently suggested, that we need to move the ducklings and goslings into an area of their own. We are still nervous about leaving them outside, as a six foot black snake killed and was swallowing one of our goslings when we discovered him. It’s finding the area that may be troublesome. We are fixing up a very old barn. (Oh, by the way, I loved your barn post!) One side (1/3) has been turned into the chicken house. The middle third is for the rabbits in their hutches and animal food and such, and the third side is for the 2 piglets and 2 baby goats we intend to get. The barn is super small compared to the ones in your ‘barn post, so we are creativity trying to fit as many animals in as we can. We want to get our own Daisy, but won’t really be able to think about that until next year. Anyway, we are trying to figure out a good place for the 12 ducklings and 3 goslings so they can be protected. We are afraid of leaving them out at night. Thanks again for your suggestions! PS I’m trying to change from ‘Anonymous’ to what I signed as my name, dianeandjack, but not sure why it’s not working. I need my Chrissy, who helped me weekly with anything having to do with technology that I needed. I sure miss her! Hey, it looks like it worked!